Are you a Fortran user migrating to Linux from a non-Unix environment? Steve shows you how to take the Linux plunge without sacrificing your “native” programming capability. An introduction to lcc, a compiler 75% smaller than gcc that also compiles more quickly and helps prevent some porting bugs. 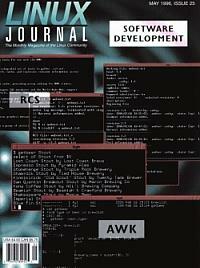 How to speed up your programming tasks using the GNU version of awk. Get flexible and reliable control of your network's interaction with the outside world.